This is one of my favorite pieces. Jerry and I went to a Ren fest in 1995, and I bought a Nepal prayer bottle... this is before I began beading, but I really wanted to wear it! 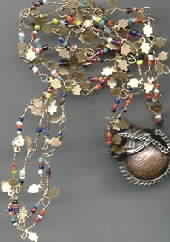 I took a vintage necklace I used to play with as a child, used 12 in. car pliers (!) to bend it, and I have a necklace that I still get compliments on! 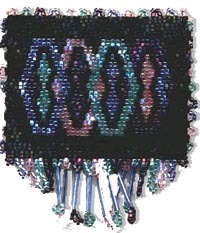 This is the first real beading I did, sometime in 1995. You guessed it, one of those cheapie $5.00 looms from the toy section, complete with cheap really uneven beads. It took about 6 months to make, cause I kept getting disgusted with how uneven and bulgie it was.. but I was hooked! I kept coming back and back until the pattern was done. I haven't loomed since, went straight into off loom stitches.. I now have a brand new professional loom from Cindy's Crafts.. and I'm in the process of graphing something to try with it!! Yum! barrette circa 1996 my first completed peyote project and the first experience with delica beads. I'm still very proud of it(mistakes and all! ), and it's of my own design. Ok, this is a bad scan. 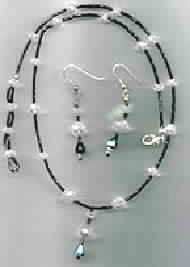 Made this in 1998, it's a quick simple necklace made with vintage 2 cuts, vintage crystals and soft-flex. I've sold a couple of these!